In New Mexico, real property can be transferred from one party to another by executing a grant deed. A standard grant deed conveys an interest in real property to the named grantee with covenants that the title is free of any encumbrances (except for those stated in the deed) and that the grantor holds an interest in the property and is free to convey it. 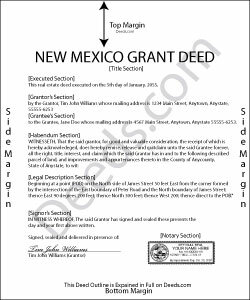 Grant deeds are not statutory in New Mexico, so the covenants should be explicit in the form of the instrument of transfer. Grant deeds offer the grantee more protection than quitclaim deeds, but less than warranty deeds. A quitclaim deed includes no warranty of title, and only conveys any interest that the grantor may have in the subject property. A warranty deed provides more protection to the grantee than a grant deed because it requires the grantor to defend against all claims against the title. A lawful grant deed includes the grantor's full name, mailing address, and marital status; the consideration given for the transfer; and the grantee's full name, mailing address, marital status, and vesting choice. Vesting describes how the grantee holds title to the property. Generally, real property is owned in either sole ownership or in co-ownership. For New Mexico residential property, the primary methods for holding title in co-ownership are tenancy in common, joint tenancy, and community property. A grant of ownership of real estate to two or more unmarried persons is presumed to create a tenancy in common, unless a joint tenancy is expressly created in the conveyance (NMSA 1978 47-1-15). A conveyance to a married couple is presumed to be community property, with some exceptions (NMSA 1978 40-3-12). As with any conveyance of realty, a grant deed requires a complete legal description of the parcel. Recite the prior deed reference to maintain a clear chain of title, and detail any restrictions associated with the property. Finally, it must meet all state and local standards for recorded documents. Note: because New Mexico is a nondisclosure state, certain types of personal information, including the consideration exchanged in a transfer of property, are withheld from public record. Sign the deed in the presence of a notary public or other authorized official. Record the deed at the county clerk's office in the county where the property is located for a valid transfer. Contact the same office to confirm accepted forms of payment. All transfers require a Real Property Transfer Declaration Affidavit, which details the sales information for the transfer. There are certain exceptions, such as an instrument delivered to establish a gift or a distribution, or an instrument pursuant to a court-ordered partition. If the transfer is exempt from the affidavit requirement, detail the reason why on the face of the deed. See NMSA 1978 7-38-12.1(D) for a list of exemptions. File this affidavit with the assessor's office within 30 days of the deed's recordation. This article is provided for informational purposes only and is not a substitute for legal advice. Contact an attorney with any questions related to grant deeds or transfers of real property in New Mexico.